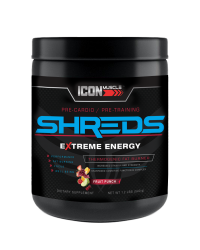 Icon Shreds Caps is are an advanced fat-shredder and performance fuel. Its intense energy will allow you to have better, longer workouts. This powerful rush does not depend on caffeine, but the is the result of carefully designed fat-burning and anti-catabolic formulas. These caps contain safe weight-loss ingredients that support your metabolism, utilize fat as an energy source, and increase energy expenditure. Raspberry Ketones, CLA, Green Coffee Bean, Green Tea, Guarana, Citrus Aruntum, Guggul, Evodia Rutae Carpa, Forskolin, Sesamin, Caffeine, Cayenne Pepper: These powerful ingredients are combined to get your mind and body ready to focus.